Soft and buttery sliced avocado coated with bread crumbs and baked. It is a healthy finger food for the kids. 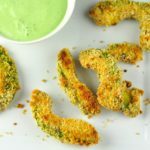 Check out the recipe for avocado fries.